Signed, Sealed and Delivered W&L clinches fund-raising goal of $50 million for athletic facilities. On June 30, Washington and Lee University hit a critical milestone in a major fund-raising goal — to raise $50 million for indoor athletic and recreation facilities. This includes the natatorium (completed in 2017) and what will be the Richard L. Duchossois Center for Athletics and Recreation, commonly known as the Duchossois Athletic Center. When W&L ended its $542.5 million Honor Our Past, Build Our Future campaign in June 2015, it had already reached the halfway point in funding for the proposed athletic facilities. Completing the project became the highest post-campaign priority, as the Board of Trustees require gifts and pledges to match the fund-raising goal of a project before it can begin. The university needed to raise the final $25 million for the June 30, 2018 deadline, the planned start of the final phase of the project — the renovation of Doremus Gymnasium and the building of the new addition on the Warner Center site. Alumni and friends of the university steadily rallied around the project. By the end of December 2017, $9 million was needed to bridge the gap. With two months remaining to the June 30 deadline, $1.5 million was left to hit the $50-million goal. Preparatory work on the new athletic center began in April, when the athletic offices moved into temporary housing in Baker Hall. After commencement in May, the fitness center and Doremus Gymnasium closed. (For more about the transition plan, click here). Demolition on the Warner Center begins. Artwork on the Warner Center wall. Removing the Cy Twombly pool. When lockers were removed, artwork appeared. The Duchossois Athletic Center includes a restoration of the existing Doremus Gymnasium and a rebuild of what has been known as the Warner Center. 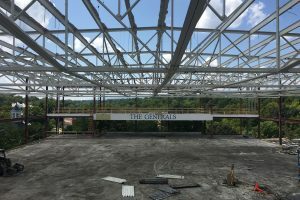 The center will encompass 165,489 square feet and will capture over 10,700 square feet of assignable space for new athletic and recreation programs. The project will also increase the square footage for the fitness center by 32 percent and will relocate and expand the wrestling room by over 84 percent. It will also allow the racquetball and squash courts to become regulation size, while doubling the scope of the athletic training facilities. Other key features will include greater handicap accessibility, a showcase for the Athletic Hall of Fame, an increase in locker room amenities and features, expanded golf practice facilities, expanded multi-purpose facilities for group exercise, and improved offices for coaches and athletics staff.